At last, many people are on the same page as people with dementia, who have been asking and ultimately begging for rehabilitation and human rights for many years. I’m past caring who takes the credit, receives the kudos for this positive change, as long as it changes!!! Below is a list of just a few articles on the topic… Thanks to James McLoughlin for alerting me to some of them. Any academics out there who follow me here, and want to write papers on this topic, we’ve made your work just a little easier! If you are a health care professional, including a medical doctor, consider reading these articles and applying them in practice. Ahlskog, J. E. (2011). Does vigorous exercise have a neuroprotective effect in Parkinson disease? Neurology, 77(3), 288–294. Artigas, N. R., Striebel, V. L. W., Hilbig, A., & Rieder, C. R. de M. (2015). Evaluation of quality of life and psychological aspects of Parkinson’s disease patients who participate in a support group. Dementia & Neuropsychologia, 9(3), 295–300. Bahar-Fuchs, A., Clare, L., & Woods, B. (2013). Cognitive training and cognitive rehabilitation for mild to moderate Alzheimer’s disease and vascular dementia. Cochrane Database of Systematic Reviews , (6), CD003260. Ball, L., Jansen, S., Desbrow, B., Morgan, K., Moyle, W., & Hughes, R. (2015). Experiences and nutrition support strategies in dementia care: Lessons from family carers. Nutrition & Dietetics: The Journal of the Dietitians Association of Australia, 72(1), 22–29. Bloem, B. R., & Munneke, M. (2014). Revolutionising management of chronic disease: the ParkinsonNet approach. BMJ , 348, g1838. Boström, G., Conradsson, M., Hörnsten, C., Rosendahl, E., Lindelöf, N., Holmberg, H., … Littbrand, H. (2015). Effects of high-intensity functional exercise on depressive symptoms among people with dementia in residential care facilities: a randomised controlled trial. Physiotherapy, 101, e892–e893. Boyle, C. P., Raji, C. A., Erickson, K. I., Lopez, O. L., Becker, J. T., Gach, H. M., … Thompson, P. M. (2015). Physical activity, body mass index, and brain atrophy in Alzheimer’s disease. Neurobiology of Aging, 36 Suppl 1, S194–S202. Cheng, S.-T., Chow, P. K., Song, Y.-Q., Yu, E. C. S., Chan, A. C. M., Lee, T. M. C., & Lam, J. H. M. (2014). Mental and physical activities delay cognitive decline in older persons with dementia. The American Journal of Geriatric Psychiatry: Official Journal of the American Association for Geriatric Psychiatry, 22(1), 63–74. Davis, L., (2005) Educating individuals with dementia: perspectives for rehabilitation professionals. Topics In Geriatric Rehabilitation, 21(4), 304-314.
de Souto Barreto, P., Demougeot, L., Pillard, F., Lapeyre-Mestre, M., & Rolland, Y. (2015). Exercise training for managing behavioral and psychological symptoms in people with dementia: A systematic review and meta-analysis. Ageing Research Reviews, 24, 274–285. Flicker, L., Visvanathan, R., & Ratcliffe, J. (2016). Timely Diagnosis for Dementia: The Need for Specialists. Journal of the American Medical Directors Association, 17(5), 462–463. Garrido-Pedrosa, J., Sala, I., & Obradors, N. (2017). Effectiveness of cognition-focused interventions in activities of daily living performance in people with dementia: A systematic review. The British Journal of Occupational Therapy, 80(7), 397–408. Hall, A. J., Watkins, R., Lang, I. A., Endacott, R., & Goodwin, V. A. (2017). The experiences of physiotherapists treating people with dementia who fracture their hip. BMC Geriatrics, 17(1), 91. Haubois, G., Annweiler, C., Launay, C., Fantino, B., de Decker, L., Allali, G., & Beauchet, O. (2011). Development of a short form of Mini-Mental State Examination for the screening of dementia in older adults with a memory complaint: a case control study. BMC Geriatrics, 11(1), 1–5. Hirsch, C. (2007). A short version of Mini-Mental State Examination (MMSE) was as accurate as the original MMSE for predicting dementia. Evidence-Based Medicine, 12(5), 150–150. Hopper, T.L., (2003) ‘They’re just going to get worse anyway’: perspectives on rehabilitation for nursing home residents with dementia, Journal Of Communication Disorders, 36(5), 345-359. doi:10.1016/S0021-9924(03)00050-9. Huusko, T. M., Karppi, P., Avikainen, V., Kautiainen, H., & Sulkava, R. (2000). Randomised, clinically controlled trial of intensive geriatric rehabilitation in patients with hip fracture: subgroup analysis of patients with dementia. BMJ , 321(7269), 1107–1111. Ko, M.-H. (2015). Exercise for Dementia. Brain & Neurorehabilitation, 8(1), 24–28. Lasisi, A. O., & Gureje, O. (2010). Disability and quality of life among community elderly with dizziness: report from the Ibadan study of ageing. The Journal of Laryngology and Otology, 124, 957–962. Lautenschlager, N. T., Cox, K. L., Flicker, L., Foster, J. K., van Bockxmeer, F. M., Xiao, J., … Almeida, O. P. (2008). Effect of physical activity on cognitive function in older adults at risk for Alzheimer disease: a randomized trial. JAMA: The Journal of the American Medical Association, 300(9), 1027–1037. Laver, K., Dyer, S., Whitehead, C., Clemson, L., & Crotty, M. (2016). Interventions to delay functional decline in people with dementia: a systematic review of systematic reviews. BMJ Open, 6(4), e010767. Lee, S., & Shin, C. (2017). Interaction of obstructive sleep apnoea and cognitive impairment with slow gait speed in middle-aged and older adults. Age and Ageing, 46(4), 653–659. Lipardo, D.S., Aseron, A.C., Kwan, M.M., & Tsang, W.W., (2017) ‘Effect of Exercise and Cognitive Training on Falls and Fall-Related Factors in Older Adults With Mild Cognitive Impairment: A Systematic Review’, Archives of Physical Medicine & Rehabilitation, vol. 98, no. 10, pp. 2079-2096. Mandel, S., & Golubnitschaja, O. (2013). Time for New Guidelines in Handling of Neurodegenerative Disorders: Optimistic Versus Pessimistic Prognosis by Application of PPPM. In Neurodegenerative Diseases: Integrative PPPM Approach as the Medicine of the Future (pp. 3–9). Springer, Dordrecht. Marshall M. Perspectives on rehabilitation and dementia: Think rehab. London: Jessica Kingsley; 2005. McLaren, A. N., Lamantia, M. A., & Callahan, C. M. (2013). Systematic review of non-pharmacologic interventions to delay functional decline in community-dwelling patients with dementia. Aging & Mental Health, 17(6), 655–666. Ngandu, T., Lehtisalo, J., Solomon, A., Levälahti, E., Ahtiluoto, S., Antikainen, R., … Kivipelto, M. (2015). A 2 year multidomain intervention of diet, exercise, cognitive training, and vascular risk monitoring versus control to prevent cognitive decline in at-risk elderly people (FINGER): a randomised controlled trial. The Lancet, 385(9984), 2255–2263. Regan, B., Wells, Y., Farrow, M., O’Halloran, P., & Workman, B. (2017). MAXCOG-Maximizing Cognition: A Randomized Controlled Trial of the Efficacy of Goal-Oriented Cognitive Rehabilitation for People with Mild Cognitive Impairment and Early Alzheimer Disease. The American Journal of Geriatric Psychiatry: Official Journal of the American Association for Geriatric Psychiatry, 25(3), 258–269. Ritchie, C. W., Molinuevo, J. L., Truyen, L., Satlin, A., Van der Geyten, S., Lovestone, S., & European Prevention of Alzheimer’s Dementia (EPAD) Consortium. (2016). Development of interventions for the secondary prevention of Alzheimer’s dementia: the European Prevention of Alzheimer’s Dementia (EPAD) project. The Lancet. Psychiatry, 3(2), 179–186. Santos, G. D., Nunes, P. V., Stella, F., Brum, P. S., Yassuda, M. S., Ueno, L. M., … Forlenza, O. V. (2015). Multidisciplinary rehabilitation program: effects of a multimodal intervention for patients with Alzheimer’s disease and cognitive impairment without dementia. European Archives of Psychiatry and Clinical Neuroscience, 42(6), 153–156. Schultz-Larsen, K., Lomholt, R. K., & Kreiner, S. (2007). Mini-Mental Status Examination: a short form of MMSE was as accurate as the original MMSE in predicting dementia. Journal of Clinical Epidemiology, 60(3), 260–267. Schwenk, M., Dutzi, I., Englert, S., Micol, W., Najafi, B., Mohler, J., & Hauer, K. (2014). An intensive exercise program improves motor performances in patients with dementia: translational model of geriatric rehabilitation. Journal of Alzheimer’s Disease: JAD, 39(3), 487–498. Schwenk, M., Zieschang, T., Englert, S., Grewal, G., Najafi, B., & Hauer, K. (2014). Improvements in gait characteristics after intensive resistance and functional training in people with dementia: a randomised controlled trial. BMC Geriatrics, 14, 73. Seitz, D. P., Gill, S. S., Austin, P. C., Bell, C. M., Anderson, G. M., Gruneir, A., & Rochon, P. A. (2016). Rehabilitation of Older Adults with Dementia After Hip Fracture. Journal of the American Geriatrics Society, 64(1), 47–54. Smith, P. F. (2017). The vestibular system and cognition. Current Opinion in Neurology, 30(1), 84. Stein, J., Luppa, M., Kaduszkiewicz, H., Eisele, M., Weyerer, S., Werle, J., … Maier, W. (2015). Is the Short Form of the Mini-Mental State Examination (MMSE) a better screening instrument for dementia in older primary care patients than the original MMSE? Results of the German study on ageing, cognition, and dementia in primary care patients (AgeCoDe). Psychological Assessment, 27(3), 895–904. Tanner, J. A., Black, B. S., Johnston, D., Hess, E., Leoutsakos, J.-M., Gitlin, L. N., … Samus, Q. M. (2015). A randomized controlled trial of a community-based dementia care coordination intervention: effects of MIND at Home on caregiver outcomes. The American Journal of Geriatric Psychiatry: Official Journal of the American Association for Geriatric Psychiatry, 23(4), 391–402. Toots, A., Littbrand, H., Lindelöf, N., Wiklund, R., Holmberg, H., Nordström, P., … Rosendahl, E. (2015). Effects of a high-intensity functional exercise program on ADLS and balance in people with dementia: a cluster randomised controlled trial. Physiotherapy, 101, e1526–e1527. Toots, A., Littbrand, H., Lindelöf, N., Wiklund, R., Holmberg, H., Nordström, P., … Rosendahl, E. (2016). Effects of a High-Intensity Functional Exercise Program on Dependence in Activities of Daily Living and Balance in Older Adults with Dementia. Journal of the American Geriatrics Society, 64(1), 55–64. Verbeek, H., van Rossum, E., Zwakhalen, S. M., Kempen, G. I., & Hamers, J. P. (2009). Small, homelike care environments for older people with dementia: a literature review. International Psychogeriatrics / IPA, 21, 252–264. 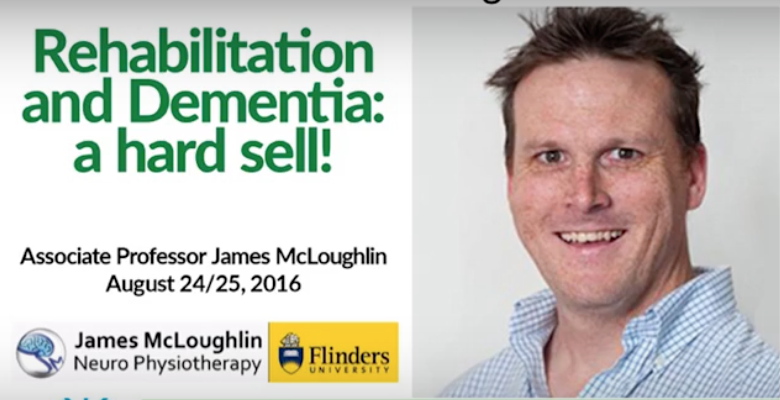 If you still doubt rehabilitation and dementia go in the same sentence, watch this video of a Webinar hosted by Dementia Alliance International presented by Professor James McLoughlin. It might change your mind… And if you are unable to access the articles listed above, please let me now. This is a wonderful post Kate and such a useful list of references. I am a speech pathologist and share your vision for improved access to rehabilitation services for people living with dementia. I regularly present on this topic and often share the new pathway of post-diagnostic support that you advocate for, linking clinicians with your blog and advocacy work. As a speech pathologist, I see access to proactive communication treatment, strategies and support as such a critical part of helping people with dementia to continue participating in roles, activities, civic duties, conversations, and relationships of the person’s choice. I also love Linda Clare’s article, provided below, that illustrates how people living with dementia identify and achieve goals that are meaningful and important to them. Another important message for health professionals to understand. I would love to connect with you and support your advocacy work in any way I can – thank you for your tireless efforts and ability to communicate these important messages in such a powerful and accessible way. You are making an incredible difference. Clare, L., Evans, S., Parkinson, C., Woods, R., & Linden, D. (2011). Goal-setting in cognitive rehabilitation for people with early-stage Alzheimer’s disease. Clinical Gerontologist, 34(3), 220-236. Thanks Jade, and I’m glad that reference list is helpful. You can email me at info@infodai.org if you want to connect further. Thanks for the list Kate. I will work my way through it today. Have fun Jim! I’ve enjoyed the SBS Insight program on exercise too, more validation from my perspective. Hope you’re well? Reblogged this on Dementia Caregivers Blog – Hope and Harmony – . Frustrating? Now, that is an understatement Ness! I’m currently developing another long list of references for rehabilitation and dementia now too! James is definitely on our page now, as are many other academics. It is to get the doctors and clinicians to refer us at diagnosis, rather than continue to bury their heads in the sand believing there is nothing they or we can do! Thanks very much for this resource Kate!